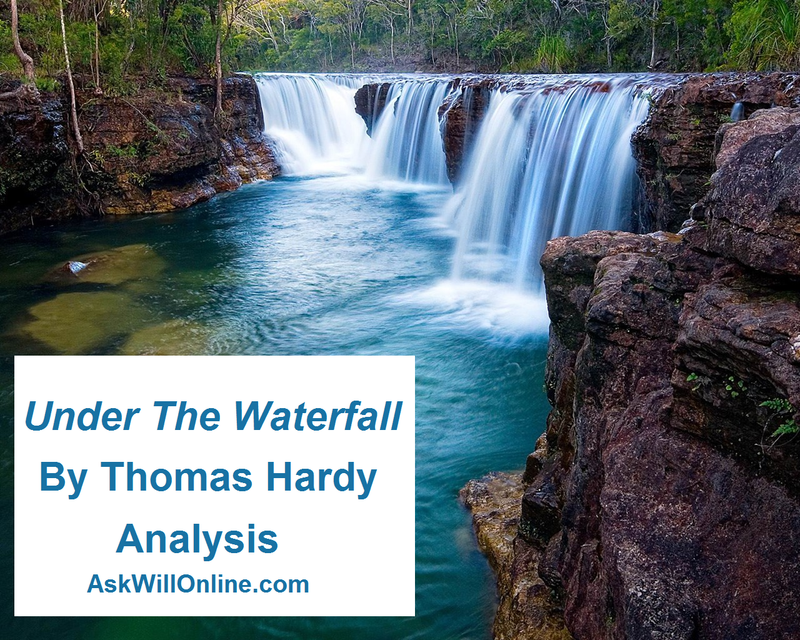 Here is a complete analysis of Thomas Hardy’s poem Under The Waterfall which retells the romantic event of a picnic by a waterfall. The poem will be retold by myself bringing out the key features and analytically comments from it. At the end of the article, there is the historical context to this poem. Feel free to skip to the parts most relevant to you. When reading this analysis, please remember much of this is an interpretation from me. As long as it is backed with evidence from the poem, it is a valid point. In short form, we can understand that a voice is evoked by a memory of having a picnic near a waterfall with their romantic partner every time s/he places their hands into a pool of water or ‘basin of water’. I say ‘s/he’ because the poem does not specifically tell the reader if it is the woman or man speaking. However, if you skip to near the bottom of this article, you will understand that it is the woman who is the first voice. The sweet sharp sense of a fugitive day. Already, we can gather the poem is being told by a woman in hindsight of a moment in time. From this, it brings to light straight away that she is talking about something from the past that cannot be regained or repeated. In essence, the ‘fugitive’ day has escaped. Hardy also uses an oxymoron here with ‘sweet sharp‘ to describe the day making clear that it was a nice delicate memory but is also a spiteful memory. The word ‘fugitive‘ means criminal which suggests that this memory of lovers was possibly against the law or was an affair where the couple was rebellious. This supports the reason why one of the couple remembers the memory vividly: from remembering the memory enables them to relive the emotions and excitement of being rebellious. However, the point is brought forward that we cannot live in the past like the start of this poem does. Grey, in this context, is a symbolism for death. This is because a ‘shroud‘ is a lengthening piece of cloth which a dead person is wrapped in before a burial. The fact that this ‘shroud of gray‘ is thickening makes clear that the memory is disappearing/becoming forgotten which will result in permanent loss like the cycle of life and death is. It could also mean that this memory has not been thought about for a long time too representing the lack of romance. This part of the poem has a fluent and natural flow to it due to the rhyming being in pairs that progress as A A / B B. This makes it feel fluent which is all used to represent the flow of the waterfall from the memory. Note the lack of use of sharp sounding letters – the ‘s‘ on ‘leaves‘ and ‘smart‘ adds to the symbolised motion of the waterfall from the way is continues the soft and flowing sound of this extract. In these four stanzas, there is a slight theme of sublime here from the way that human affairs (such as the one between the woman and man) have such little impact to the environment of mother nature’s landscape. The use of ‘purl‘ makes the scenery of the waterfall feel like it is a treasure to see. More than anything though, human’s affairs come and go with time. The scenery does not. The scenery lives through time unlike humans do. And has spoken since hills were turfless peaks’. The use of ‘kingdom‘ provides an archaic form to this poem at this moment. We associate kingdoms and castles with the middle ages where there were ‘wars, in peaces‘. Again, Hardy uses ‘purl‘ again to add similarities between the runlet (small stream) and valley. However, this can bring up a different interpretation that he uses purl again as a form of juxtaposition: the power of a valley is far greater than that of a stream. The first stanza basically is about a women having an event in the present time (being dipping her arm in water) which evokes a memory from the past which has strong feelings tied to it. Can we live in the past with memories. From the start of the second stanza, is clear that the second voice (being the man) is now talking from the use of speech marks. The man is questioning the woman. He is asking her why she is getting strong emotions from just plunging her arm into a bowl of water. From my point of view, this contrasts against the above stanza which was very dreamy. This stanza starts sharply back into reality with the man asking exactly why she is being dreamy. A great point which I think reappears throughout the poem is the words used by Hardy associated with falling such as ‘plunged‘ and ‘slipped‘. As well as representing the water falling down the waterfall, it could also represent the ups and downs of the lover’s relationship. The woman answers the questions at lines 17-20. She found an object under the waterfall of much beauty. We can gather its precious and beautiful from the words that describe it such as ‘prized‘, ‘smoothness opalized‘. The word ‘opalized‘ makes clear that the object is showing varying colours (like an opal does). An opal is a gem stone. Therefore, whatever she is describing is very naturally beautiful and divine. This passage of the poem replicates the structure at lines 5-8. Just like at lines 5-8, there is the used of the ‘s’ (glass, pass and sky) to make this section flow much like the waterfall. The voice describes their partner as ‘my lover‘. Therefore, we can deem the couple to be very affectionate for each other. The woman is expanding on her memory going into more detail. The shock of a question to the poem slowly resorts its way back to being dreamy again from the woman answering with a detailed explanation of their memory. We can gather the memory was by the edge of a stream where the lovers sat down to fruit and wine in a basket to have a picnic. There is alot of imagery used in this poem to help encapsulate the reader into the thought process of the first voice so that the reader relives the beautiful memory like the voice is. The vivid colours creates a scenery of perfection: the sky is blue, the grass is green and the weather is hot, ‘In the burn of August’. From describing this memory in such detail makes apparent to the reader that this is not just any memory – it must be a special memory for the first voice to remember it in such detail even though it was ‘Fetched back from its thickening shroud of gray’. The woman is now describing how they both drank from the same wine bottle (with the bottle representing their love for each other) and she went to rinse the bottle but it slipped and fell into the stream. Again, ‘sank‘ is another word associated with falling. Here, the lovers are attempting to recover the glass by plunging their arms into the water to retrieve the bottle. This is most likely why the first voice recalls the memory ‘Whenever I plunge my arm, like this / In a basin of water‘. Thomas Hardy uses imagery lovely imagery here ‘stooped and plumbed‘ and ‘little abyss’. With an abyss being a seemingly bottomless chasm, it is clear by describing it as ‘little‘ contrasts against the true meaning of what an abyss is. The actions of the lovers being ‘stooped and plumbed‘ help make the poem flow. They are not aggressive words – instead, they are being delicate when trying to retrieve the bottle. The fact that the bottle has fallen could represent how the love of the couple has deteriorated: the bottle will stay there forever contrasting against the lover’s love which will not. This is the part of the poem which answers why she ‘awakens a sense of that time‘ from dipping her arm into water. The bottle she had dropped into the stream had obviously not been retrieved by the lovers. Therefore, that is why she was able to see the bottle ‘under the fall, in a crease of the stone‘. The word ‘cascade‘ is a small waterfall. Hardy gives the waterfall a poetic feature such that the waterfall is rhyming when the water cascades down, ‘cascade’s rhyme‘. The attention to detail from the first voice makes clear how beautiful a memory it was to her because she has not forgotten any of the detail. The reader is also able to know now that the memory was a very distant memory because there are now plants growing around the bottle. This links in with the question, ‘Can we live in the past with memories?‘ It is clear the woman is doing exactly this: if it was a memory that only just happened, then it is clear that one of the reasons they are recalling it is because it is still fresh in their memory. However, the fact its distant makes clear she is living in the past. This begs the question why? Is the relationship with the lover not as good as what is use to be? Is the relationship going downhill like Hardy hints at with the constant use of words associated with falling? This poem’s message can be based much on interpretation. As long as the waterfall keeps having water fall down it, the lover’s love will continue. Hardy makes a link between nature and love using the waterfall as a symbol for the couple’s love. This gives the waterfall great importance because it can be deemed one of the main features of the woman’s memory. To give this poem a bit of historical context, the poem was wrote about a woman named Emma Lavina Gifford who married Thomas Hardy back in 1874. However, they no longer become affectionate to each other and Emma Lavina Gifford died in 1912. Even though Hardy had been alienated away from Emma for so long, he took the death of Emma extremely badly, often finding that the only way to manage his traumatic feelings was to write poetry about her. Under the Waterfall is one of many poems that Thomas Hardy created for Emma after she died. Although it is unsure whether this actual memory ever happened (and somewhere by a waterfall, there is a bottle down the crease of a rock), one thing is for sure that his love for Emma never disappeared – when he died, his heart was buried with Emma and his body at the Abbey’s Poet Corner. Therefore, when Hardy uses imagery that the waterfall ‘Persistently sung by the fall above‘, Emma and Hardy’s affection for each other may have died (or deteriorated). However, their love for one another was more than just a slight affection. The waterfall is a powerful symbol. Hardy describes that the stream is a ‘runlet that never ceases‘. Just like the waterfall will never cease too, Hardy’s love for Emma will continue for eternity. I asked why is the women living in the past earlier on in this article. It isn’t the woman living in the past but Thomas Hardy himself. The only way he can manage his feelings towards the passed-away Emma is through reliving their best memories together through poems. Thomas Hardy is using the art of poetry to let himself feel again the emotions he felt while with Emma. Hardy has been really clever here. He knows like everyone, we will all be born and die. Our love for one another will only last as long as we live. If you represent your love for someone as a symbol from nature, such as a waterfall, it will last forever because a waterfall will never stop flowing. Time is the limiting factor of love. But, for Hardy’s love to Emma, there is no limiting factor. His love for Emma is truly eternal. This is so so much help, thank you so much! There's no other website that goes into as much detail as you do! They weren't rinsing the bottle, it was the glass. The little abyss was only a few spans wide but was deep, too deep to get the wine glass back It is an actual chalice that is lodged there. Its presence adds to the sound (purl) of the fall; it has changed it. Ever since that day the (cascade's rhyme) 'rhyme of love' that the fall makes is different. This runlet's purl is very old (since the hills were mountains), and now it has been forever changed. Now when she sees the design on the edge of a chinaware basin, and feels the cold water on her hand and wrist she remembers the day love changed nature. This was so helpful. Tank you for explaining in so much detail!